Dogs are descended from wolves. This is not a point of dispute; it is a fact. The dog and wolf have the same scientific name, with the dog “categorized” as a sub-species to the wolf. A wolf is categorized Canis lupus and the dog Canis lupus familiaris. Dogs like wolves instinctually seek a social order. This social order has one or more leaders and a hierarchy below that. These leaders are typically the strongest, smartest, and most fit of the dogs in the tribe. These leaders are called “alphas.” There can be male alpha, a female alpha, or a mating pair of alphas. Because this is what the dog must have, a social order with an alpha, it is very important that you establish yourself as alpha as soon as possible. If you do not your dog will assume alpha position and there will be no successful training. Please understand, you are training your dog how best to live with you. No matter how much you love your dog, if you do not assume alpha position your dog will. And alphas, being leaders, do not take training. To claim alpha status you must do a number of things that the dog naturally recognizes as making you the leader. One of these is control of food. Another is “correction,” dogs naturally expect to live by rules and correction is a means of establishing what is and is not acceptable. To that end I will make a number of suggestions which, if you follow, will insure that you assume alpha status. This will make training your canine pal much easier and with training your dog will be a welcome and responsible member of the family. You should start training as soon as the dog becomes comfortable with you. This should be no more than one or two days depending on how much you interact with your dog. Of course sooner would be better, and there are bound to be some accidents in the meantime, but trust is paramount. Now this is not to say you can’t train later. For example if you’ve rescued a dog that is not a puppy you most certainly can still train it and the sooner the better. There is never a good reason to hit a dog. You want the dog’s trust and love. Hitting the dog will destroy trust. As acting alpha your dog’s deepest desire is to please you. This is also instinctive. So hitting is not only not necessary, it is confusing to the dog and has the potential of creating a mean dog that otherwise would not have been. All alphas eat first. They get the “choicest cuts,” the most tasty portions, and as much as they want. After the alpha has eaten, only then do subordinates get to eat. This is a clue as to how you train your dog. Make sure you eat before your dog eats. He or she will see that you are eating (they are always capable of recognizing both food and the act of your eating) and wonder where his or her portion is. If you completely finish your meal before feeding the dog you automatically assume one of the characteristics of alpha. I highly recommend that you completely finish you meal, in full view of fido, before your dog gets to eat. Anita has been away for two months. On her return she is greeted with great respect as the long lost alpha. These are wolves not dogs. Notice that the first wolf to arrive is the current Alpha. Anita bears her teeth because this is what wolves do when they greet family that has been away. At about the mid point you'll see one wolf standing over another. The wolf on the ground on it's back is a subordinate. The wolf standing over the subordinate is "chastising" the wolf on it's back for breaking protocol. You'll notice there has been no growling or biting and certainly no "hitting." I list this after eating because this is when your dog is most likely going to need to go. When you see your dog “going” in the house immediately say “no” and attempt to distract the dog until you can take him out. Never discipline a dog after the fact. The only time to correct a dog for going in the house is during the act, never after. Attempting to correct the dog when you find a mess is far too late. Yelling at your dog for making a mess after he’s made it will just confuse the dog. The idea here is to train not confuse. If you catch your dog in the act and she can’t stop herself in time make sure to tell her “no,” firmly, and then take her out. This way she’ll learn to respond to “no” and wait until you can get the collar, leash, and head outside. Take your dog out at regular times. Dogs have built-in clocks and will quickly become accustomed to going out at certain times of the day. If they are used to that they are much more likely to be able to wait to go out, knowing that they can wait till that time. This is the most important single word you can teach your dog. For example, puppies, like humans, go through a teething stage. Just like humans their teeth are coming in and just like humans biting on something pliable (like your shoes) helps with bringing the teeth past the gum line. This also means the puppy might bite you. Now the bite isn’t out of defense or even meant to harm you. The puppy is simply teething. As I said before, dogs need rules, they are geared to live by them, and “no” is a great way to teach your dog the rules. Before long, pulling back will no longer be necessary. The word “no” will be all that is needed to prevent your dog from "breaking the rules." Completely ignore the dog. No positive reinforcement, in fact, no attention at all. This may be confusing to you so let me expand on what I mean. For example don’t say “no” if the dog doesn’t get what you are trying to teach it. “No” is reserved for behavior you don’t want to reinforce. Instead say nothing and do nothing. If the dog doesn’t get it there is no reward. Simply keep trying and be patient. After all your dog didn’t come equipped with a understanding of language, but she did come with the ability to adapt to speech. Take advantage of this ability by displaying patience and giving rewards only when they are due. The two most important attributes you can display to your dog are patience and keen observation. So, during training you want to be very attentive to the dog’s reactions, display patience at all times, and reward good behavior as soon as you see it. This is the second most important word you can teach your dog. As stated above a dog will soon learn that “go for a walk” or “do you want to go out?” means that you are prepared to go for a walk with him or her. Trying to leash and/or collar an excited dog can be a challenge. So teaching your pal “sit” can be very convenient. This is a little more difficult than “no.” Your dog did not come equipped with a ready understanding of human speech. The good news here is that they are not only willing to learn, but readily prepared to recognize a huge variety of sounds and associate some meaning to them. This includes human speech. The difficulty for the dog is translating your words into his or her actions. There is a very easy way to accomplish this. Make sure to collar and leash your dog. Say “sit,” once only. If she or he does not sit, poke down the rear end with your finger. The dog may not sit, but you will succeed in moving its rear closer to the floor. If this does not cause the dog to “sit” use your other hand to push back on the chest. This will naturally cause the rear to move downward if his or her rear legs don’t move. You may need to do this many times before the dog realizes what you want. Hang in there. It is worth it to teach the dog this one word. Once the dog figures out what you are trying to accomplish and actually sits, be sure to reward the dog. I prefer praise to treats, but at this point in time you want results. Eventually, and this may take weeks, your dog will know that “sit” means to sit down. As “sit” training progresses be sure to observe the dog carefully. At first don’t expect the dog to sit immediately. He or she may hesitate and sit very slowly. You want to give the dog some extra time to comply in the beginning, but always praise or treat when “sit” is performed. Eventually treats and praise will no longer be necessary. Remember; only say “sit” once for that action. If you say it multiple times the dog may conclude that he should sit only after hearing the word three or so times and that is not the object of this training. Sit is an excellent command to teach the dog. Use “sit” as a requirement for treat, as a prelude to going out, and any time you want the dog to be still. It’s just a saying and has no foundation in reality. Dogs, throughout their lives, expect to adhere to rules. This doesn’t stop just because the dog got older. Any dog can be taught something new no matter how old. In point of fact, if a dog has been trained already, it will be much easier to teach an older dog new commands that it will be to teach a puppy or young dog. You’ll read all sorts of advice about hand signals, word commands, and so on. The truth is that your dog will follow whatever command you establish. 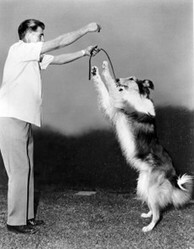 You could even use the word “jump” when training your dog to “sit” and the dog would learn to sit when you say jump. To put this another way, it is entirely up to you how you train your dog. Hand signals, verbal commands, even facial gestures could be used. The dog will quickly associate some action with your desires. It is my opinion that the two best trainers that can be readily emulated are Victoria Stillwell of “It’s Me or the Dog” and Cesar Millan of “The Dog Whisperer.” Both these trainers get excellent results, but their methods are almost completely opposed. Cesar rewards with praise and bad behavior with a "thump" on the chest. Victoria rewards with treats and she may also push a dog away as reprimand. Millan has been criticized for the “thump,” but in my observations this is not a hit. It isn’t delivered to cause pain and is never hard enough to cause pain. It is an unpleasant sensation for the dog though and that way it is effective. Victoria, on the other hand, never uses more than a push as warning. Even though their methods are very different, they both get the results they are striving for. By studying the methods of either of these people you can adopt a method you are most comfortable with. As training with "no" and "sit" progresses your dog will come to expect that other single words require some action on her or his part. The more your train your dog the more training the dog will expect. Over time the dog will begin to associates certain actions with words without any real training required. When that happens congratulate your dog. My current guy showed up at my doorstep. He was so malnourished you could see the bones in his back as well as his ribs. He wouldn't eat for the first day and the second he would only eat from my hand. It took over a year for him to start acting like a regular dog, but he does now. I have no idea what he went through, but I have to think it must have been horrific. Very nice article. We adopted a dog from a shelter that came with a lot of baggage. It took a long time to make him into a good pet. I've never heard of finishing your food before your dog does. Good tip. Just remember, an adult dog can "hold it' for quite a while. A puppy, like a baby human, can't. It might be helpful to get puppy pads until six months when she'll be much more physically able to hold it. That or just take her out more often. The eating tip is just a trick. It is a way for us humans to emulate the dog's natural pecking order. In a way most of my advice is more human training than dog training. Great tips, Liam, and very well explained. Nice article.